This is a 1.2 meter (4 ft) and 13 mm wide beige leather dog lead made of full grain thick belting leather (4 mm thick). It has attractive handmade plaited detail instead of stitched leather. Dog Moda's leather dog leads come with our special safety chrome coloured trigger hooks which, unlike many inferior quality trigger hooks, will not open accidentally. This type of trigger hooks is used by husky teams and climbers in Scandinavia and is considered by many to be one of the safest trigger hook design. These short leather dog leads are very strong, yet comfortable and light in your hands. 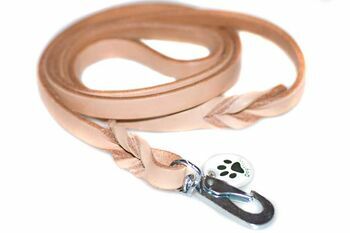 Great dog lead if you are looking for shorter and wide beige leather dog leads. We recommend these wider handmade beige leather dog leads with our small, medium and large size hound collars. 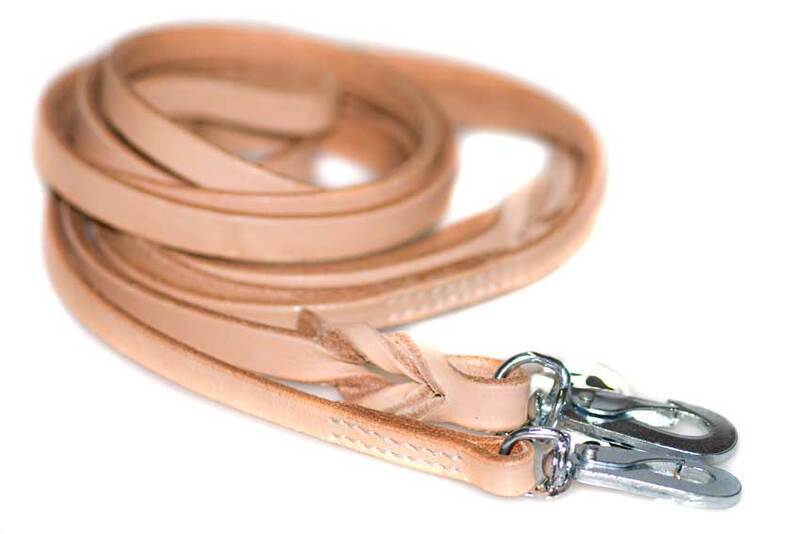 Great everyday beige leather lead for dogs that pull, as it combines top quality, uniqueness, functionality and great price. Thank you very much for recommending to me this lovely plaited beige leather dog lead. It is amazing and matches the hound lead perfectly. I am very pleased with the dog lead, it is lovely quality leather and the width is great! I am sure it will give trustworthy service at lure coursing. Your website is easy to navigate, payment process painless and the dog lead arrived the next day so, overall, I would rate your service A1.